Singapore must beef up vocational skills training and develop leaders capable of taking on global roles if it wants to win the worldwide war for talent, a new report concludes. 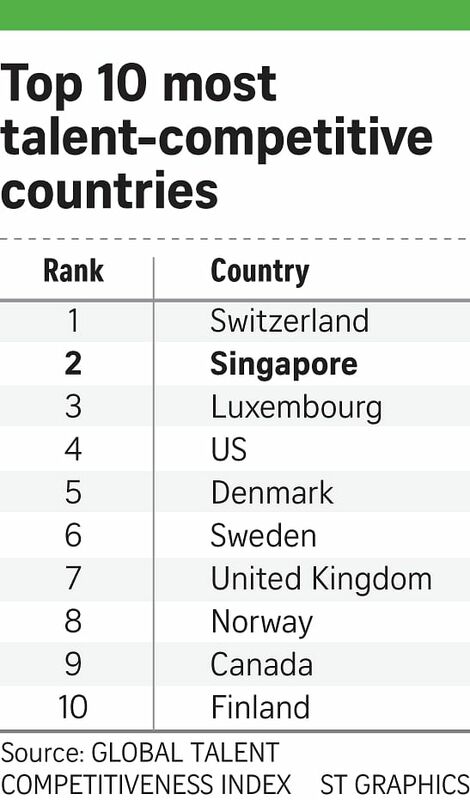 The Global Talent Competitiveness Index, released last week, ranked Singapore the world's second-most talent-competitive country for the third straight year, behind Switzerland. It is the only Asian country in the top 10 of the index, compiled by the business school Insead, the Adecco Group and the Human Capital Leadership Institute of Singapore. The annual study measures a nation's competitiveness based on the quality of talent that it can produce, attract and retain. While Singapore remains one of the most attractive locations for global talent, it is facing strong competition from its neighbours and this will only intensify as regional integration gains pace, according to the report's authors. Grooming talent to take on global or regional roles at top companies remains a key challenge, said Professor Paul Evans, the Shell Chair of Human Resources and Organisational Development, Emeritus at Insead and co-editor of the report. "(You) cannot run a global company in a senior management role unless you have in-depth international experience... The issue of how we can develop our own people instead of relying on expatriates remains a key challenge," Prof Evans said in an interview with The Straits Times yesterday at the report's Asia launch. "Things are so good in Singapore that taking a risk and moving one's family, even to somewhere nearby like Indonesia, is not attractive to many Singaporeans." Leaders need to "develop a deep feel" for the region, he added. "It takes a lot of resilience and deep inner courage to run a large corporation, and I really don't think that resilience can be developed any other way except through deep personal experience." The solutions are clearer when it comes to building up a pool of vocational talent - Singapore has responded to its technical skills shortage by trying to change mindsets and shift towards an educational system which embraces varied pathways, said Prof Evans. Ms Wong Su-Yen, chief executive of the Human Capital Leadership Institute, said that even as Singapore focuses on attracting "the best brains from around the world to help us develop made-in-Singapore innovations", the country has to encourage its own people to venture out. Research has found strong links between talent mobility and innovation, she noted. While Singapore remains one of the most attractive locations for global talent, it is facing strong competition from its neighbours. "Companies need to appreciate that when you bring in diversity, that drives innovation... And as individuals, people need to be willing to take that uncomfortable step to move out of their comfort zone."